How many shows has your dad sat through for you? Dance recitals, plays, parades? 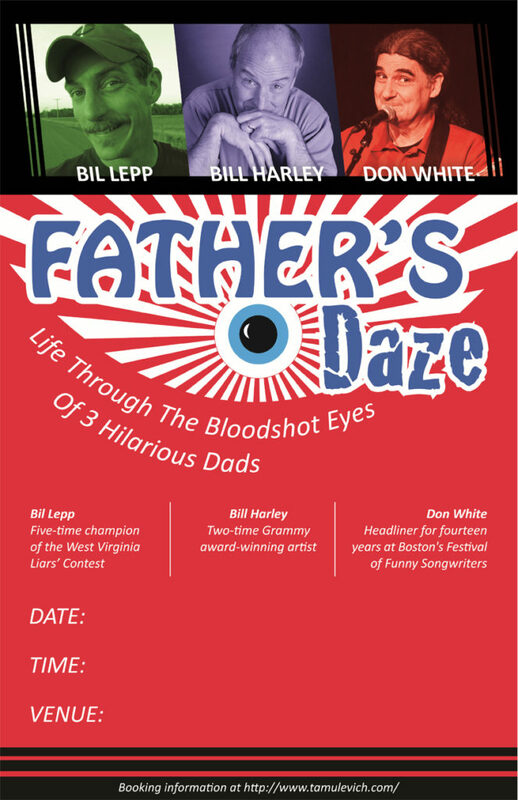 Now there’s a show made to brighten dad’s bloodshot eyes (but the whole family can come), a new humorous storytelling show from dad’s perspective – Father’s Daze – starring three of the funniest people in the country. Bil Lepp, Bill Harley, and Don White take you through the Dad Experience. You’ll hear about teenagers. Drawers full of fomenting cologne, novelty ties, and socks leftover from Christmas. Driving lessons. Teenagers. Getting older. Shopping. Music lessons. Day jobs. And teenagers. Give dad a break and let him laugh and revel in the shared experience he can never talk about that is fatherhood. If it were your show, he’d go for you. A storyteller, author, and recording artist, Lepp’s works have received awards and recognition from The Parents’ Choice Foundation, The National Parenting Publications Assoc., and the Public Library Assoc. In 2011, Bil was awarded the National Storytelling Network’s Circle of Excellence Award. Lepp has been featured 15 times at the National Storytelling Festival, and performed at major storytelling festivals, at the Smithsonian Folklife Festival, and at corporate events and functions across the country. He performed at Comedy Central’s Stage on Hudson in Los Angeles, CA.